Skills and Abilities: He has been trained by Captain America and Night Thrasher in martial arts and unarmed combat. Powers: Rage has superhuman strength, resistance to injury, healing and reflexes. His strength can also increase to limitless levels similar to the the Hulk when Enraged or involved in violent activity. Elvin was a small, weak, puny boy growing up in Brooklyn, New York. He is noted as a voracious reader who read at the college level he also enjoying reading comic books. After meeting a boy who wanted to trade comics he traveled to an apparently white neighborhood and was set upon by a racist gang. Fleeing from the attackers he hid in a filthy drain way filled with garbage and toxic waste. When his attackers left he tried to climb out but couldn’t. That’s when fresh toxic waste was dumped and landed on him from Fisk Biochem. It smelled worst than the filth he was in already and burned. Making his way home he was cared for by his “Granny Staples”. With her prayer and care he recovered and grew stronger in size and stature [Avengers vol.1 #328]. Elvin now appeared to be a man in his mid-30’s. He wanted to enact revenge and vengeance on those who had wronged him but his grandmother stopped him. Sometime later he took up a mask and became the crime fighter Rage [Avengers vol.1 #328]. Brimming with confidence he showed up at Avengers Mansion demanding to be made an Avenger. After a heated debate with Captain America about the lack of black Avengers he was attacked by the avengers who misunderstood the exchange. After leaving the mansion he broke up a drug ring before destroying the drug lord’s mansion [Avengers vol.1 #326]. Upon realizing the Avengers were in danger he raced to their side and was drawn into another dimension with them [Avengers vol.1 #327]. After the defeat of the demons in the dimension and leaves the dimension he recounts his origin to Captain America [Avengers vol.1 #328]. When the team is re-structured he is offered membership by Captain America on the reserve Avengers team. At the press conference announcing the new team Rage is attacked by a civilian and gets into yet another argument [Avengers vol.1 #329]. When the “Tetrarchy of Enropy” takes his grandmother hostage the Avengers help him in defeating them and saving his neighborhood [Avengers vol.1 #330-331]. Later adventures include facing Doctor Doom, or more accurately three Doombots [Avengers vol.1 #332-333], Thane Ector and the Brethren [Avengers vol.1 #334-#339]. Rage grew increasingly unhappy with the Avengers lack of involvement in community level crime. They are drawn into conflict with the New Warriors thanks to Hate Monger [Avengers vol.1 #341]. 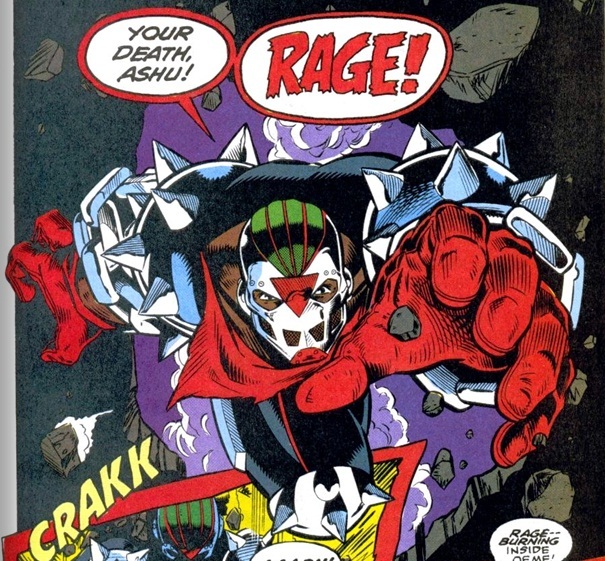 Rage had an argument with Captain America and joined the more street level New Warriors led by Night Thrasher. Rage ends the threat by overpowering Hate Monger. During the conflict it is revealed he is a teenager, 14 years old. Captain America then demoted Rage to the status of Avenger Trainee. He leaves the Avengers and allies with Night Thrasher and the New Warriors [Avengers #342]. Rage later helped the New Warriors on a mission which involved stealing an avenger Quinjet. After commandeering the ship he accompanied the team to “The Temple of Dragon’s breadth”. Here they faced Midnight’s fire, Smiling Tiger and the “Folding Circle”. They later battled the sorceress Tai and lost the Qunjet int he process [New Warriors vol.1 #22-25]. When he confessed his action to the Avengers and apologized he was met with the anger of the Greek god Hercules and he was dismissed from the team by Captain America. It didn’t matter however as he was offered a spot on the New Warriors team and even given a new costume to celebrate [New Warriors vol.1 #26]. He also continued to serve his community as a local crime fighter [New Warriors vol.1 #27]. Alongside the team he battled the “Force of Nature” supervillains [New Warriors vol.1 #28-30]. He also participated int he “Child’s’ Play” crossover between X-force and the New Warriors [New Warriors vol.1 #31]. Rage was pulled into the Forces of Darkness, Forces of Light crossover which found [New Warriors vol.1 #32-34 and New Warriors Annual #3]. The hardest time in his life was upon him as a new gang had taken over his neighborhood and he witnessed his home blown up by a rocket launcher and his beloved grandmother died in his arms [New Warriors vol.1 #37]. As an orphan he lived up to his code name as it was the only emotion he could feel.His powers blossomed and his strength and dexterity increased. Alongside the team he planned to hunt down those responsible and kill them all. At the end of the conflict he had the upper hand on the new gang leader but despite Night Thrasher’s pleading he snapped the villains neck to full fill his revenge [New Warriors vol.1 #38]. Legal problems followed since he was still a minor he was to become a ward of the state. Luckily his teammate Night thrasher worked something out for him and also had a proper burial and memorial for his grandmother [New Warriors vol.1 #39]. When time was altered by Lady Sphinx he was drawn into conflict with her and the original Sphinx [New Warriors vol.1 #47-50]. When the team grew too large and had to be trimmed he was one of the few who made the final cut [New Warriors vol.1 #51]. He was still a member of the team when they faced the Psionix [New Warriors vol.1 #52-53] .Over time the New Warriors drifted apart and it came down to a choice of following Nova or Night Thrasher Rage chose to stay with his guardian and they began operating as a a duo [New Warriors vol.1 #57]. They continued to monitor the the team and later recruited the Psionix team and made it their own. When the warriors were in danger because of the villain Genecide they came to their aid [New Warriors vol.1 #63-64]. They would later rejoin the team only for it to be disbanded [New Warriors vol.1 #72-75]. Around this time he finally deciding to put school before heroics so he went to boarding school and became a reserve member of the Avengers once again. He would come out of “retirement” to assist the avengers on a few adventures.The first of which was facing Morgan Le Fay and her altering the timeline [Avengers #1-4, 1998]. He continued to moonlight with the New Warriors and helped Justice and Firestar decide whether they should remain with the Avengers of not. The brief reunification had them facing “Lord Templar” [Avengers #13, 1998]. He was also present during the disassembling of the Avengers [Avengers #501-503]. He later watched as most of his former teammates were killed in the ‘Stanford Incident’ which caused Civil war. During civil war he sided with Captain America’s anti-registration heroes. He was later arrested and freed and participated in the climatic battle. Once Captain America surrenders though he signs up with ‘the initiative’. He later quits and joins a newly reformed New Warriors under Justice his old teammate.